The SlackWater Center at St. Mary’s College of Maryland is a consortium of students, faculty, and community members documenting and interpreting the region’s changing landscapes. Oral histories are at the core of the center, which encourages students to explore the region through historical documents, images, literature, and scientific and environmental evidence. Some of this work has been published in the print journal SlackWater, some of which is online and some published here. The work below was first published in spring 1999 in SlackWater Volume II: Cedar Point 1942. SlackWater attempts to suggest how Southern Maryland, in particular St. Mary’s County, was transformed from an isolated agricultural community to a newly shaped culture, one that reflected the social and economic changes of a larger nation at the onset of World War II. It uses people’s recollections as bits and pieces of history to tell a story of what the war and all it brought meant for Southern Marylanders. SlackWater emphasizes the changes that occurred on the American homefront during the war, and how those historical occurrences have led to a thriving community. Many newcomers today do not know Cedar Point. Those of us who now call Southern Maryland home know of Patuxent River Naval Air Station, and Lexington Park, and Town Creek. Forgotten are places like Pearson, and Fordtown, and Jarboesville. 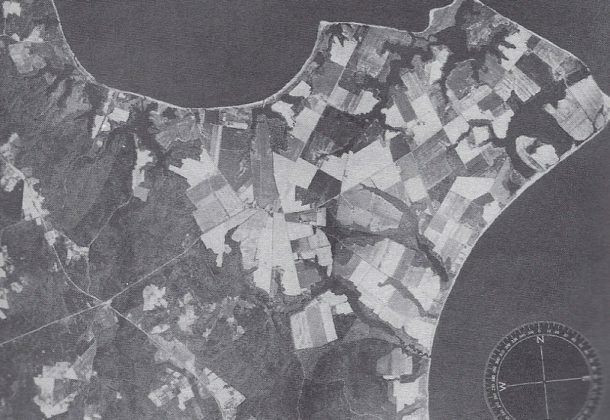 Patuxent River Naval Air Station now suggests flight simulators, weapons testing, and test pilot training, and no longer fertile farmland; the patchwork of farms and settlements were pushed down and smoothed over to make the Navy’s mission possible. In many ways, what happened to St. Mary’s County during the war was typical of what occurred in other regions as industrialization swept across American farmlands and sharecropper shanties. In the 1930s the South had a rural population of about fifteen million. By 1960 only seven million remained. The rest had left for wage labor, for city or factory jobs that offered a degree of security or a shot at economic equality. “Many Southerners,” commented cultural historian Pete Daniel, “having traveled and tasted relative affluence, became dissatisfied with the rural cycle of labor and debt that had characterized their lives.” Small farmers were replaced by the industrial advances of agribusiness, machines and complexes that took away the small farm’s competitive ability and labor supply. World War II rearranged populations. Old social structures crumbled and new ones emerged. The transformation at Cedar Point mimicked these nationals trends. In 1940 the population of the county rested at 14,626, a figure that remained relatively constant since the first census in 1790. But by 1950, that figure jumped to 29,111. And with these newcomers came a new form of industry, which rapidly supplanted agriculture. By 1950 four runways, three seaplane basins, hangars for 400 planes, a diesel power plant, steam plant, and sewage disposal sprawled across the former tobacco fields and oyster beds. Farmers were leaving the uncertain business of crop futures and bad harvests for the retirement plans and medical coverage of government jobs. Other changes reflected a newly emerging social order as well. Women, for the first time in a long time, were beginning to take on traditionally male occupations. The summer of 1945 saw an influx of 550 enlisted women and 35 women officers. These WAVES, as they were called (Women Accepted for Volunteer Emergency Service), often worked maintenance and service jobs, as “grease monkeys” doing work they weren’t supposed to be able to do. Gender roles, definitions, and restrictions were breaking down under the weight of global war. As Daniel points out, when outsiders pour into a once isolated area, those who would otherwise have remained strangers are suddenly thrown together. In St. Mary’s County, “going among strangers” meant that old stereotypes collided, particularly stereotypes about race and race relations. Daniel explains that “as blacks and whites competed for jobs, housing, recreation, and seats on public transportation vehicles, the problem of the color line assumed new urgency.” Moreover, base employment meant wages for a population often bound to others by peonage, and wages meant a newfound social freedom. Cash knows no race. But segregated practices were still relatively slow to change. Housing erected to accommodate the enormous influx of population was segregated housing. By 1943 family units consisting of low, concrete buildings known as the “flattops” were built. The Federal Housing Authority set aside 150 for whites only, and just south of these an additional 125 “flattops” and 71 dormitory units, called Carver Heights, were set aside for blacks. Higher-paying “skilled labor” jobs were simply not available to blacks. The cafeteria, barracks, and lavatories were all segregated. Change, as our interviewees tell us, was not without strife. Clearly, Patuxent River Naval Air Station was a catalyst during the 1940s and 1950s. An era of radical national change was brought to St. Mary’s County largely through the infusion of people and funds associated with the base. The same bus routes used to transport would-be construction workers from D.C. to Cedar Point in 1942 and 1943 would carry racially mixed passengers to hear Dr. Martin Luther King in the summer of 1963. When bars and restaurants opened to serve the Navy, they simultaneously opened the county to a diverse population hailing from far beyond the rivers and field of Southern Maryland. But social change was never the goal of the Patuxent River Naval Air Station; it was a side effect. The goal was to test aircraft at sea-level conditions. Cedar Point, whose low-flying farmlands slipped easily into the river and bay, was ideal, and soon the Navy was testing electronics, radio and radar, and aircraft armament, as well as aircraft materials and design. In 1945 the Flight Test Pilots’ Training Program was added, and by 1947 had expanded and was renamed the U.S. Test Pilot School. Among the first seven astronauts selected by NASA, four had trained at the Naval Test Pilot School: Scott Carpenter, John Glenn, Walter Schirra, and Alan Shepard. Others would follow. Over the next forty years the Naval Air Station would continue to grow new limbs. The Aircraft Anechoic Test Facility, the Air Combat Environment Test and Evaluation Facility, and the Aviation Survival Training Center are some of the additions. … Under the 1993 and 1995 Base Realignment and Closure (BRAC) decisions, two entire major naval installation and components of three others relocated to the Patuxent River Naval Air Station bringing 10,900 new jobs and generating an estimated $691.6 million, as well as new technology-based computer companies in support. The trajectory from agriculture to high-tech industry and the resulting change in social relations is, perhaps, a typical story for many areas. If SlackWater has a purpose, though, it is to make this story atypical, to call up the lives beneath the events. Anne Lancaster, whose father Frank Aud ran the country store at Pearson, moved to Georgia with her husband, but then returned to work at Patuxent River Naval Air Station in an office overlooking the site of her old home. E. Webster Dyson, a Cedar Point native, worked the night shift on the base for over thirty years so he could spend his days doing what his father once did to support the family: fishing, crabbing, and oystering. Fred Talbert moved away from his home in Crossett, Arkansas, and after a stint in the Army, found himself married, living far from his family farm, and mired in the racial attitudes of a foreign place. SlackWater is an attempt to destandardize our history, to tell the individual stories rather than to homogenize the summary. The first installment of “This Happened Here” [“SlackWater: World War II Transforms So. Md.”] can be read here. The second installment [“SlackWater: Cedar Point Erased to Make Way for Base”] can be read here. The third installment [“SlackWater: Navy Brings ‘Boomtown Years'”] can be read here.